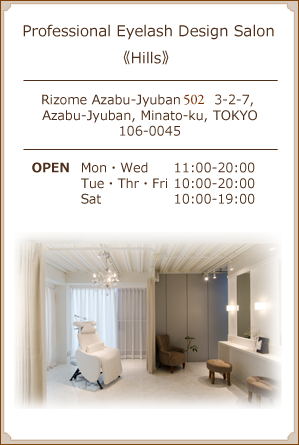 Hills® is a salon located in Azabu-Jyuban, Tokyo that specializes in eyelash. In live with our belief that the women’s beauty stands with the eyes, Hills® can offer the best services to attract the best charm from our guests. Everyone’s eyes are completely unique in terms of their size, shape, depth and color so it’s not a one-size-fits-all approach when it comes to applying eyelash extensions. Every application in Hills® is completely customized to the wearer so you can discuss what look you would like to achieve with our eyelash application expert. Hills® technicians take exceptional pride in maintaining a high standard of hygiene and professional application as well as proper technique which enable not only the perfect finish but also the long time keeping of the perfectness. With Hills® relaxing atmosphere, comfortable reclining chairs and music, you will drift away into bliss while we work meticulously to provide you with a serene atmosphere and high-quality services. Set up an appointment and get on your way to the most beautiful you. *Hills® is government officially registered salon and all staff is licensed as beautician. Copyright © 2012-2016 Hills All Rights Reserved.